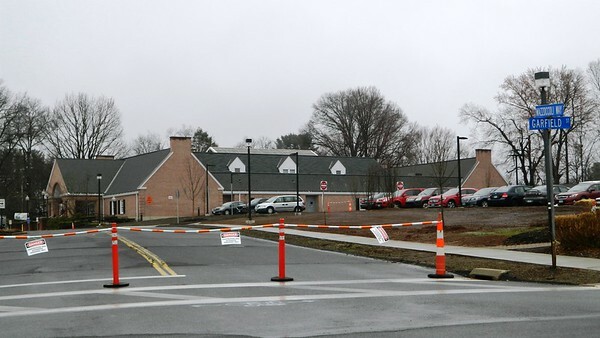 NEWINGTON - As the long-anticipated Town Hall and Community Center renovation began this week, town employees and residents adjusted to changes posed by construction. The $31.2 million project will culminate with a 42,000 square foot building in about 22 months time. The new facility - about half the size of the current one - will be built in what is now the upper Town Hall parking lot. Mazzoccoli Way was closed to traffic on Monday and this lot also was closed. 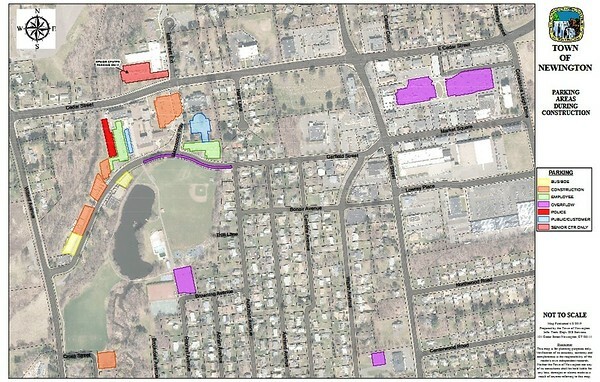 Over the next two years, visitors and employees of Newington Town Hall, the Lucy Robbins Welles Library, the Mortensen Community Center and the Newington Police Department must adhere to temporary parking regulations. A newly paved parking lot adjacent to the library is now open. People with Town Hall business are encouraged to park there or near the police station, in spaces marked as one-hour parking. Additionally, visitors can park on the south side of Garfield Street while being aware of construction activities. Overflow parking is also available in Mill Pond Park, near the tennis courts. Town and library employees have been directed to park in the lot closest to Garfield Street or the police station lot. The southeast wing of the existing building will be the first to go, as students in the Newington Transition Academy have already moved into a temporary space elsewhere. Once the new building is complete, staff will move in and the old building will be completely demolished. In its footprint, new parking areas will be constructed. 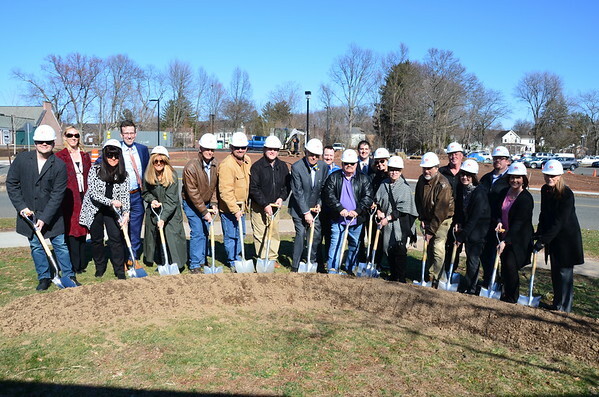 The Town Council and Board of Education joined members of the building committee that planned the project in a recent groundbreaking ceremony. The new layout is designed to be more efficient and easier to navigate with energy-saving components. The adjoining community center will be 50 percent larger than the current Newington Parks and Recreation wing and gymnasium. Town Manager Tanya Lane said the disruption would be well worth it once Newington has the new facilities. Newington Freemasons even played a role in preparations. Members of the Sequin-Level Lodge #140 on Walsh Ave. gathered in the Town Hall lobby last week to remove a 1,500-pound decorative totem pole that has stood there since 1993. 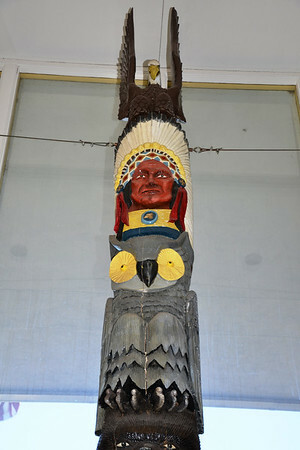 It was crafted by hand from a 22-foot tree trunk by resident woodcarver Walter Wartshow, who died in 2004. 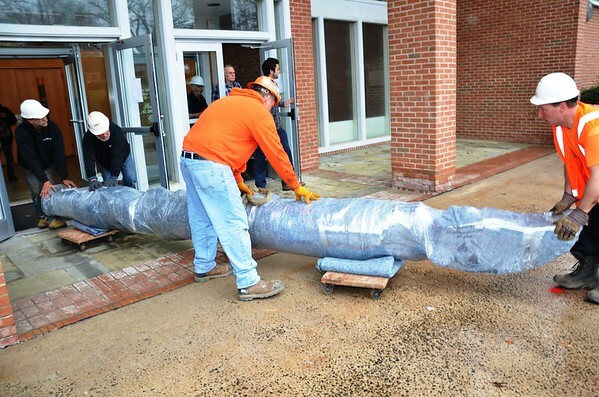 Masons carefully dismantled the pole and wrapped it for safe removal and transportation. The main entrance will be closed during construction. People can enter through the lower level near the police station. Library staff are relieving some of the hassle for their patrons by establishing curbside service. “Lucy To Go” will be available Monday to Thursday from 11 a.m. to 7 p.m. and Friday and Saturday from 11 a.m. to 2 p.m.
Members can call the library at 860-665-8700 to request up to five specific titles, giving staff their library card number and the make and model of their vehicle at least an hour before expected pickup. Before leaving home or upon arrival they can call 860-665-8713 to have their order brought out to them curbside. Library accounts must be in good standing to use this new service, according to Head of Circulation and Collections Management Jeanette Francini. Fines must be paid inside the library or online. Posted in New Britain Herald, New Britain on Friday, 12 April 2019 20:28. Updated: Friday, 12 April 2019 21:28.